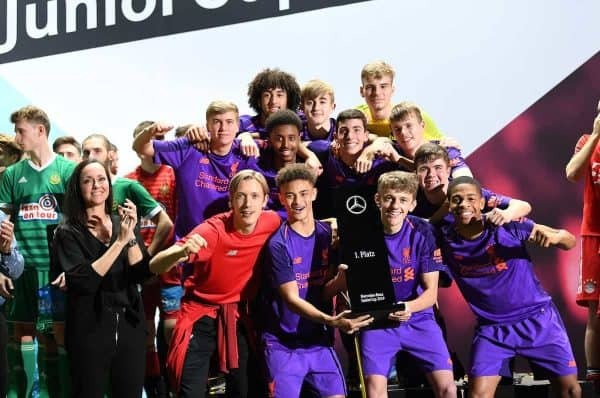 Liverpool under-18s have tasted victory in the Mercedes-Benz Junior Cup in Germany after coming from behind to beat Rapid Vienna in the final on Sunday. The young Reds, led by Barry Lewtas, headed to Stuttgart for a weekend tournament involving sides from the Continent and beyond and returned victorious on Sunday. Rather than the usual format involving the age group, this tournament is a six-a-side competition which has gained a prestigious reputation in recent years. While the side was comprised of the Reds’ U18 players, it is an U19s tournament. The likes of Joshua Kimmich and Manuel Neuer are players who have made their name in previous editions of the Mercedes-Benz Junior Cup and several young Reds will be hoping to tread a similar path in years to come. There was an initial group stage on Saturday, from which Liverpool’s U18s yielded a defeat and two victories to progress to the knock-outs. First of all came the loss, which saw Atlanta United take a three-goal lead—only for the young Reds to work their way back to 3-3. However, a late winner for the USA side ensured there was work to be done in the next two fixtures. Hosts Stuttgart were next up and Liverpool won 1-0, thanks to Jack Walls’ strike, while Elijah Dixon-Bonner and Fidel O’Rourke each netted to beat Schalke 2-1. Jake Cain was then the match-winner as the Reds saw off Bayern Munich in the semi-finals, 1-0, setting up a final against Austrian side SK Rapid Wien. A back-and-forth encounter saw the Austrians take the lead, before Abdi Sharif scored a cool first-time finish to equalise. O’Rourke then cleverly side-stepped a challenge before placing an effort in the far corner to give Liverpool the lead, before a powerful turn, run and strike from Remi Savage put the Reds 3-1 up. Rapid pulled one back, but Liverpool held on to win the match and lift the trophy.